First of all, I want to thank the 48 Group Club and the China Chamber of Commerce in the UK for inviting me to address your joint symposium. It is a real pleasure to join all of you this evening. I am also happy to attend this very first event of the China Chamber of Commerce since it was founded. Let me take this opportunity to extend my warmest congratulations to the founders and new members of the China Chamber of Commerce. My speech today is about China's 13th Five-Year Plan. Early last month, the Central Committee of the Communist Party of China adopted a proposal on the national economic and social development plan for the period from 2016 to 2020. This is the proposal on the 13th Five-Year Plan. This is a very important plan as it sets out China's development priorities in the coming five years. 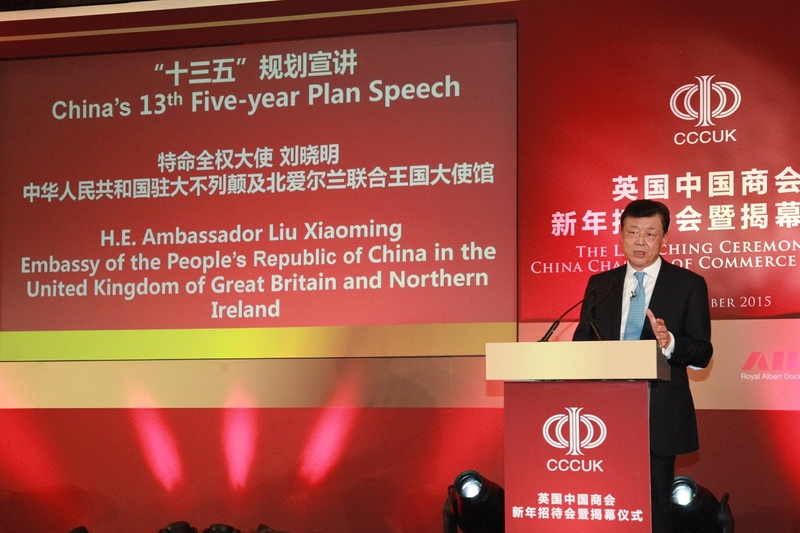 Back in 2010 when I first came to London, China put forward a proposal of the 12th Five-Year Plan. It immediately became a focus of worldwide attention. Many people in the UK also showed great interest. I fed this interest by publishing articles in newspapers and gave several interviews and speeches on the 12th Five-Year Plan. The 13th Five-Year Plan is attracting even greater international attention. China is now the second largest economy in the world. Its sheer size means inevitable growing impact upon other economies. It is not surprising that when China planned to roll out a new Five-Year Plan, it is immediately and carefully studied around the world. · How will China continue to contribute to the global economy? · Where will the 13th Five-Year Plan lead China's economy? These questions could be very much on your mind too because of your interest in China. You have long supported and cared for China's development, and you have taken an active part in China-UK cooperation. 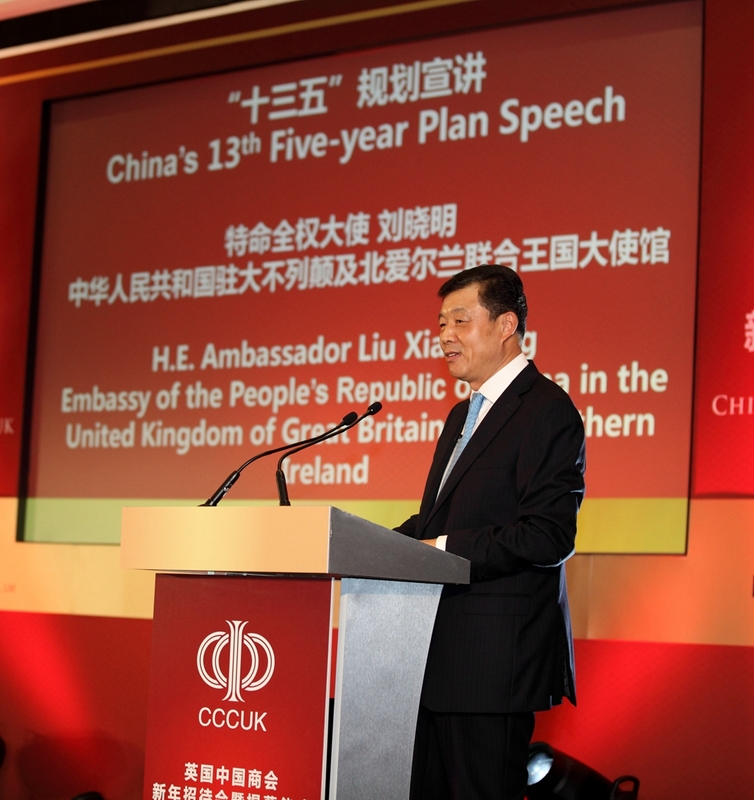 That's why I very much value today's opportunity to share with you some of the highlights of China's 13th Five-Year Plan, and discuss with you the new opportunities this plan will create for China-UK relations going forward. · It will be China's opportunity to overcome the 'middle income trap' and continue its development at a higher level. · It will be the immediate run-up to the target year set for the first of the two 'centenary goals', namely, building a moderately prosperous society by around 2020. · It will be a decisive step in our journey to realise the renewal of the Chinese nation. · to strengthen Party self-discipline. "Development concepts decide the big picture, the fundamentals and the direction. They will have a long-term impact. Our actions are always led by development concepts." So, the five development concepts I mentioned a moment ago are the key elements of the 13th Five-Year Plan. These five concepts will very much drive forward China's development in the coming five years. For those who try to understand the 13th Five-Year Plan, these five concepts hold the key. Innovation is put before the other four concepts because the 13th Five-Year Plan will make innovation the basis for growth. That is to say, China will make its system and structure more innovation-friendly. We will focus on innovation-driven growth and build up first-mover advantage. "Strengthen structural reform on the supply side to improve the quality and efficiency of supply." · Stimulate innovation and entrepreneurship. · Create new demands and new supply. · And give rise to new technologies, new industries and new businesses. One can expect to see science and technology leading all innovative activities. This is because China will roll out a list of major research projects that will matter a great deal to stimulate the overall and long-term development of the country. At the same time, China will speed up the building of innovation platforms represented by a number of national laboratories. One can also expect to see China implementing the strategy called, "Made in China 2025". The result will be China rising up the value added ladder to fast becoming a strong advanced manufacturing country. All in all, China will act swiftly to make its market, its structures and its institutions more innovation-friendly. I now turn to the second concept, which is balanced growth. In the coming five years, coordinated and balanced growth demands utmost attention. The 13th Five-Year Plan proposes that achieving balanced growth will strengthen the weak links and open up more spaces for growth. This means that the more developed eastern coastal region will take the lead and bring other regions on board. This also means that more support will be given to China's great western development, the northeast revitalization and the rise of the central regions. A number of growth hubs will be created as China pursues more balanced development among different regions. One example is the coordinated development in the area encompassing Beijing, Tianjin and Hebei Province. Another target is the building of the Yangtze River economic belt. · Reform of the household registration system will deepen. · Resources of public services will be evenly distributed between cities and the countryside. · This will be achieved by extending the reach of urban public services to the rural areas. Now, let me talk about the third concept, which is the green economy. · And shifting to a mode of production and consumption that is more resource conserving and environmentally friendly. Despite the efforts and progress, challenges still exist. A key factor is that pollution remains a serious issue. There is growing public demand and expectation for fresh air, clean water, safe food and beautiful environment. · Energy conservation and emission reduction. · Energy structural and technological upgrading. · Low carbon economy with effective systems of recycle and reuse. · Acute pollution control and eco-system protection and restoration. · And stronger rule-based environmental protection and more effective enforcement. The fourth concept is opening-up. This will be a key development concept as China continues to map out a new opening-up landscape and set up a new opening-up mechanism. · They will be joint ventures in which decisions will be taken with all the stake-holders. · The initiatives and efforts will be made together. · And benefits will be shared by all partners. Geographically, the Belt and Road will link up China's eastern, central and western regions, and run through Eurasia and part of Africa. · It will enable China's central and western provinces and border regions to open up further. · It will speed up the economic transformation and upgrading in the coastal provinces in the east. · And this will help shape a new open-up landscape in China that incorporates the land and the sea, that matches the strengths of China's west and the east, and that opens up to every corner of the world. · This will be a belt of emerging economies unprecedented in span and coverage. · The initiative has the potential of becoming a new source of growth for the global economy. · It will enable the participating economies to cooperate for mutual benefit and common prosperity. · And overall, it will create a sense of "community of common interests and shared future". Now, I turn to the final and fifth concept. This is inclusive development. As the ancient Chinese political philosophy has revealed, people are the foundation of a state. Therefore, the people's well-being is central to China's development. This reflects how China's development is always for the people, of the people and shared by the people. The 13th Five-Year Plan will be a "plan for sharing". It will be a plan for each and every one of the 1.3 billion people to have a share of the economic growth. · China will adopt more targeted measures of poverty reduction to help all of the remaining 70 million poorest in China. This will lift them out of poverty and enable them to join the rest of the population in moderate prosperity. · China will work to provide full coverage of more effective basic public services, from education to employment, from healthcare to pension and old-age care. This also includes the establishment of a nationwide social security network, basic pension insurance and medical insurance by 2020. · China will deepen the reforms of the judicial system, the household registration and the income distribution. The aim is to create greater social justice. · And China will further improve the grass-root democratic system to safeguard the right to equal participation and self-development. 'Give moderate prosperity to the hard-working crowd. The next five years will be decisive as China strives to build a moderately prosperous society. While the 13th Five-Year Plan lays out a new 'blueprint' and maps a new journey for China, it also offers new opportunities for China-UK cooperation in at least six areas. First, there will be new opportunities in trade and investment. · China will focus more on quality rather than quantity of trade. China will improve the quality of exports and increase the emphasis on value-added. · China will adopt a proactive import policy and open its market wider to the world. · China will create a pro-business environment that is more rule-based and international. · China will make its market more accessible to foreign investors by fully implementing the pre-access national treatment and the negative list management. · And, China will also support Chinese companies in search of investment opportunities overseas. · The Chinese market will be more open. · The quality products and services from the UK will enjoy even greater popularity in China. · British companies will find a level playing field and a more transparent environment in China. 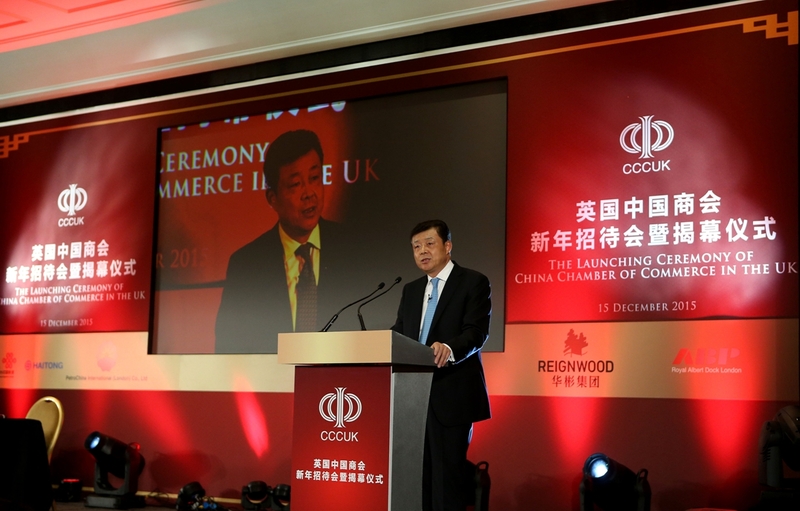 · And more Chinese companies will make investment and set up business in the UK. Second, there will be new opportunities for financial cooperation. · Speed up the reform of the financial system. · Expand two-way opening in the financial sector. · And build a fair, transparent and healthy capital market. Two weeks ago, the IMF announced the inclusion of Chinese yuan into its SDR basket. This decision will greatly accelerate the internationalisation of the RMB. · China and the UK can increase the scale of currency swap. · China and the UK can further consolidate the role of London as the RMB offshore trading center. · China and the UK can continue the feasibility study for a stock exchange connection scheme between Shanghai and London. · And China and the UK can also enhance cooperation in multilateral financial institutions such as the IMF, World Bank, the AIIB, etc. The third area of new opportunity for China-UK cooperation is innovation. The Plan clearly lists innovation as the number one driving force for growth. China will encourage entrepreneurship and innovation, including scientific, cultural and business innovation. · Britain has mature and effective mechanisms to inspire and encourage creativity. · Britain is one of the global leaders in scientific, technological and cultural creativity. · Innovation and creativity constitute the basis of the strong competitiveness and industrial strength of the UK in the global market. · China is ready to work with the UK to take cooperation on innovation to a higher level. · And together China and Britain can build a strong partnership for innovation. Now, let me turn to the fourth area of new opportunity for China-UK cooperation. In the coming years, China will experience rapid regional integration and urbanisation. There are many successful examples of a fast-growing metropolis bringing the surrounding areas on board. Building such metropolitan hubs is proposed in the 13th Five-Year Plan. This will include Beijing-Tianjin-Hebei coordinated development area and the Yangtze River economic belt. In the process of such rapid urbanisation, China will strive to make it an urbanisation that put people first by improving urban planning, development and management. The UK was one of the first countries to begin urban planning studies. In Britain you already have the highly developed London metropolitan area, and now you are building the Northern Powerhouse. In the field of urban planning, China has a lot to learn from the UK's comprehensive legal framework and success stories. There is unlimited potential for mutual exchanges and cooperation in coordinated regional development and urbanisation. · China seeks to build an energy conserving and eco-friendly environment. · China has a clear aim to move its industries towards a low-carbon, circular economy. · And China will make its own and new contribution to the world ecological security. The UK was the birthplace of the industrial revolution in the modern age. In the long process of industrialisation, Britain had good times and bad times. It suffered from pollution and gained experience in pollution control. From the British experience, China can learn about sustainable development and green economy. Following the outcome of the recent Climate Conference in Paris, China and the UK will work even more closely. This means our two nations will take active parts in the international cooperation for sustainable development and jointly respond to climate change. Last, but not least, there will be new cooperation opportunities for China and the UK in the field of public service and social security. · China will increase the supply of social services. · China will deepen the reform of medical and healthcare systems. · And China will respond to the challenge of an aging population. China and the UK have signed an MOU on health care cooperation. Our two countries have had effective cooperation in medical service and public health. In the future, public service and social security will become a new area of cooperation between China and the UK. In turn this will contribute to our respective growth. · China has started its economic upgrading. · China's policies on the Belt and Road initiative draw our ties even closer. 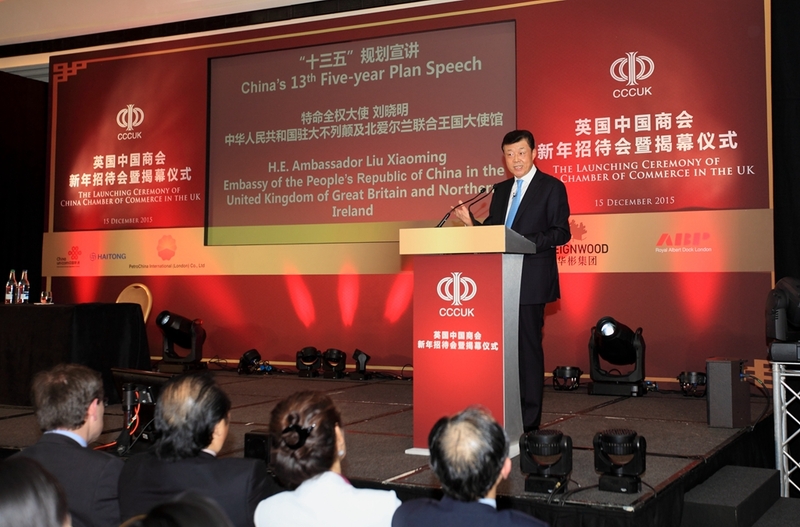 · And recently, China and the UK unveiled the 'Golden Era' for an enduring, open and win-win relationship. For our enterprises and business leaders, the next five years will be highly significant. · This will be a strategic window for growth. · This will be a golden period with unprecedented opportunities. · And this will be a time of competition for the daring and the courageous. "Without a path-breaking spirit and the 'venturing' spirit, it is impossible to blaze a trail and to create a new undertaking." There cannot be greater truth than what these two great men were trying to communicate, that is, anyone who wants to achieve something great must be daring and must act now. My dear friends, now is the moment for you to seize the day and seize the hour. · Let us join hands to take China-UK business ties to a new level. · Let us continue to create new highlights in China-UK cooperation. · Let us work for a broader, higher and deeper China-UK relationship. · And let us turn the 'Golden Era' into a stream of great, tangible and memorable mutual benefits. I am very happy to take your questions.